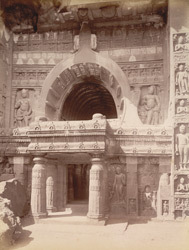 Photograph of Cave 19 at Ajanta in Maharashtra, taken by Deen Dayal in the 1880s, Curzon Collection: 'Views of HH the Nizam's Dominions, Hyderabad, Deccan, 1892'. The cave temples of Ajanta are situated in a horse-shoe valley of the Waghora river in West India and consist of prayer halls (chaityas), or monasteries (viharas), built for Buddhist communities. The caves were in use for about eight centuries, and can be divided into two groups coinciding with the early Hinayana and later Mahayana phases of Buddhist art. The first group was excavated during the 2nd and 1st centuries BC. After a period of more than six centuries, the excavations restarted around the 5th century AD, in the Vakataka period. Cave 19 is an elaborate rock-cut chaitya hall from the late 5th century. The external facade has a large horseshoe-arched window flanked by figures of yakshas and Buddhas carved in relief. A columned portico precedes the entrance. The outer walls are decorated with figures of seated and standing Buddhas alternating with columns covered with elaborate ornamentation of scrollwork, foliation and jewelled bands. The side shrines are supported by columns with luxuriant pot and foliage capitals.